Does the family groan when it's time to decorate the outside of the house for Christmas? 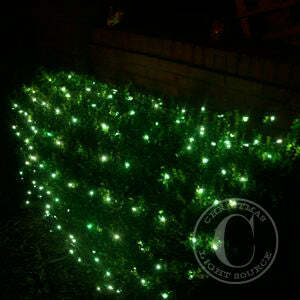 Lessen those moans by purchasing these green net lights! One of the easiest light sets to decorate with, your shrubs and small trees can be covered in a uniform lighted pattern without spending hours wrestling with lights. And, the green wire blends in with the natural green of your landscaping. Each set of net lights comes with 150 mini-lights on a 4' x 6' web of strings. A stackable male plug allows up to 2 sets to connect at one corner. You can use these net light sets both indoors and outdoors. Net lights are also a great purchase for covering porch railings and fences. Consider decorating your outdoor gazebo with a series of green net lights for a fun, lighted outdoor structure all year long! These are also perfect for St Patricks Day and outdoor dinner parties. Lights work so far. We will have to see how they hold up for the season and years to come.